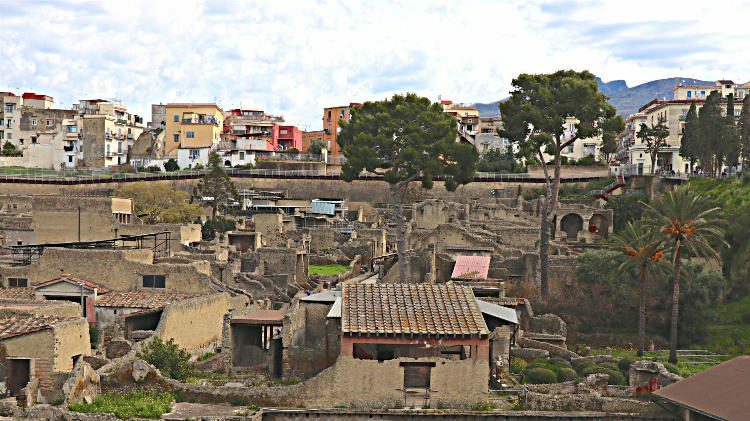 Getting to the archaeological site of Herculaneum using public transportation (train) or car is easy while many guided day-trip tour buses arrive from Naples, Sorrento and Rome. Getting to the excavations of Herculaneum (Scavi di Ercolano) by public transportation is easy, fast, and cheap on trains from Naples or Sorrento. The archaeological site of Herculaneum, like the nearby the excavations of Pompeii, is at the foot of Mount Vesuvius just to the south of Naples in Italy. This hugely impressive sight is easily reached by train from Naples downtown, bus and train from Naples Airport, or on day-trips from many parts of Italy, including as far away as Rome and Florence. The archaeological site of the Herculaneum excavations is only around 15 km (10 miles) to the south of central Naples and Naples airport but traffic from the city center could increase driving times to well above half an hour. Driving from the airport to Herculaneum could be as quick as 20 minutes as it is mostly highway – exit highway E45 (A3) at Ercolano and follow the signs to Scavi (Excavations). Paid parking is available near the archaeological site. The Circumvesuviana train is for most travelers the easiest public transportation option to reach the excavations of Herculaneum from Naples or Sorrento, and any other destination that requires transfers in either town. 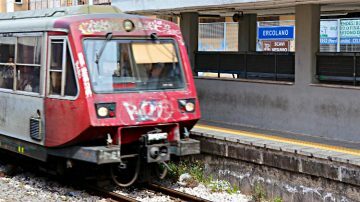 These local commuter trains connect Naples and Sorrento via amongst others Ercolano (for Herculaneum) and Pompei Scavi (for Pompeii ruins) twice per hour from early morning to late night. Traveling from Napoli Garibaldi (Naples central station) to Ercolano takes around 20 minutes (15 minutes on the DD express trains) and around 50 minutes from Sorrento. Traveling time to Pompeii from Ercolano Scavi (Herculaneum) is around 20 minutes. Ercolano is the modern Italian writing for the town, station and excavations. English usually use the Latin Herculaneum for the historical Roman ruins. Tickets for the Circumvesuviana regional trains must be bought from the ticket window – buy return tickets to save queuing time. Most rail passes are not valid on this regional train but the very handy Campania Arte Cards do work on this line too. The ticket fee is currently just less than €3 one-way. The Circumvesuviana commuter trains are without air conditioning and may get very busy at times. Pickpockets are known to operate on this train, especially when close to Naples. The express trains simply stop at fewer stations – there is no difference in the comfort of the trains. The Circumvesuviana Garibaldi station is in the basement of Naples central station (Stazione Centrale FS). Once past the ticket barrier, there is only a small coffee bar in addition to the three railway platforms. Check the train times on the screens before passing through the ticket barrier – it is more pleasant to spend time in the spacious open station area with several coffee and shopping options. At busy times, it is a good idea to go down to the platform a few minutes early before the rush of arriving passengers going up the stairs. Go to the far end of the platform to board the first coach of the train traveling from Garibaldi. The Circumvesuviana train to Ercolano (and Pompeii) usually departs from platform 3 but not all trains departing from here stop at Ercolano and Pompei Scavi. Make sure the final destination is Sorrento. If unsure, ask any local – they all know exactly where foreign tourists are heading. The Circumvesuviana train station closest to the Herculaneum excavations is Ercolano (Scavi Vesuvio). From here, it is a ten-minute walk through the town center to the archaeological site. The route is well signposted and basically straight down once in the main road. It is hardly worth taking a taxi and definitely not worth queuing for one to simply reach the excavations. Ercolano station is a simple affair. No luggage storage and no facilities once past the ticket barriers – postpone going through until just before the trains arrive. Note that Naples and Sorrento (including Pompeii) use different ticket gates – it is not possible to change platforms once past the barriers. To return to Naples from Ercolano, board any train heading for Napoli-Porta Nolana station. For Pompei Scavi, use any train with Sorrento as final destination. Luggage storage is available at the Herculaneum ticket office but it is a long drag through town if schlepping luggage. Splurge on a taxi, especially on the uphill walk back. 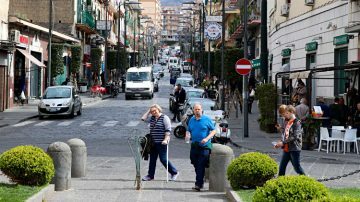 The road between the train station and Herculaneum is lined with restaurants, cafes and bars. None are particularly appealing and with Naples only 20 minutes away, few would regret postponing a meal by half an hour. Getting to the excavations of Herculaneum from Naples Airport is fastest by car (taxi or airport shuttles) but cheapest by bus and train. Traveling time from Naples Airport to Herculaneum by car can be as fast as 20 minutes, as driving is mostly on highways. Taxi2Airport and Suntransfers quote around €80 for a pre-booked taxi. Transfers from Naples airport to Sorrento or the Amalfi coast with a stopover en route at Herculaneum and / or Pompeii are available and a convenient, if pricey, option when time is limited. The cheapest way to get from Naples Airport to Herculaneum is to take the Alibus from the airport to Garibaldi Station (Stazione Napoli Centrale FS) and continue from there on the Circumvesuviana train as described above. The Alibus to / from Naples International Airport in Capodichino is €5 – tickets available from the driver, no passes valid. Traveling time is around 20 minutes to the station. Book Herculaneum Tours at GetYourGuide. Travelers from Rome to Herculaneum could either drive, use the train, or book day-trip excursions. Most group day-trips from Rome head for Pompeii only but a few also include Herculaneum. 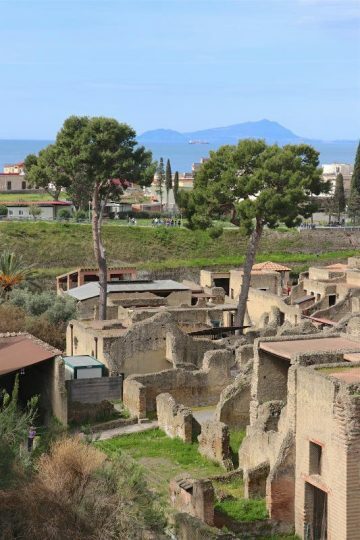 Families and small groups may find better value in private tours, which should be easy to adapt to include Herculaneum in addition to Pompeii if desired. Traveling by train or bus from other parts of Italy generally require a transfer at Naples Central Station to the Circumvesuviana train. The fast trains from Rome take only just over an hour to Naples. Buses are cheaper but expect journey times over two hours. Many day-trips are available from Naples and Sorrento (or the Amalfi coast) to Herculaneum with the option to see both Herculaneum and Pompeii on the same day also very popular – the two sites are only 20 minutes apart. 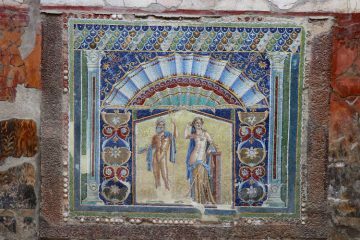 Book Tours to Herculaneum at GetYourGuide.